This is a little scarf I am knitting with a pretty pear-colored fiber blend I got from Spirit Trail Fiberworks. It’s Cotswold/CVM/Alpaca roving that spun up with a sweet texture, and I plied it sort of willy-nilly on purpose. Well, in reality, I just wanted to spin spin spin, so I let the fiber do what it wanted to do, and I ended up with this nice yarn. The pattern is the Corrugator Scarf, and I’m using size 8 needles. I think. I’m apporaching the knitting sort of willy-nilly, too. 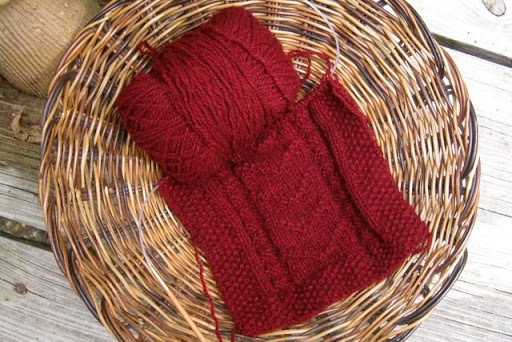 I have 280 yards spun up so far, and if I get to the end and the scarf looks nice, then I’ll stop there. Otherwise, I’ll try to replicate my “approach” and spin more yarn. Socklessness can last only so long before it begins to gnaw at me, so I pulled some yarn out of a bag and began the Spring Forward socks from Knitty. The yarn is — surprise! 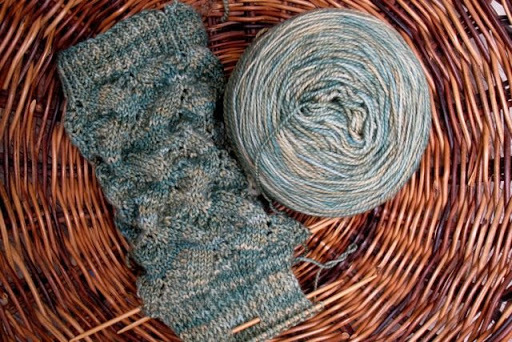 — Sundara Sock in Sea Green over Willow. The pattern is easy to memorize and fast to knit, only I made a little error on one row halfway down the cuff. Don’t tell anyone, but I left it there, because does it really matter if the YO’s are one stitch off on one half of one row of a sock? I thought not. Last but not least, here is the Narragansett Bay Scarf that matches the hat I finished last week. I got this far when the sock urge took over, so it’s waiting until I finish the first sock. I played around with needles and drape for quite a while before I settled on size 6’s for the Buffalo Gals yarn. I’m pleased with it so far. The clock is ticking ever so slowly today, just because I am waiting for a phone call. I’m hoping that the nurse at Dr. Pearl’s office will tell me when I’ll get to start chemotherapy. I’ve been scheduled to have a port implanted (or inserted or installed or whatever the technical term is) on September 4th, and that has to happen first, so I’m assuming… I’ll be participating in an interesting study, so there is paperwork and stuff to take care of, but I passed all my tests with flying colors and I’m ready to go. Why wait? Congratulations on passing all your tests! and on the new projects. Sending you loving thoughts. YEAH! For passing all your tests with flying colors! You sound like you are more then ready to move on with our treatment. Go Jane!My favorite is the top yarn. I just adore the way the colors blend gently together. It looks so soft. The sock pattern doesn’t look at that simple to me to memorize … :)On to chemo! I like the pear-colored yarn. There’s something about handspun yarn that’s just meant for scarves. Congrats on passing your tests with flying colors. It’s oh so hard to wait when you’re ready to go. Hopefully you’ll get your call soon. waiting is never ever fun.glad that you are showing what you are up to without delay!and no, I don’t think that a teensy imperfection is a probelm on the top of a sock – remember, its only socks AND it lives under your pant cuff anyway, so who cares 🙂 (giggles)I hope the doc calls you faster than you imagine. Waiting is difficult! I hope you hear soon. Your pear colored yarn looks delicious. I would love to work with some like it if it feels as good as it looks, too. Also, about the error in your socks, aren’t we hard on ourselves for no particular reason? If I ever meet you and you have them on, I promise not to point and giggle. God speed on your chemo threatments. I don’t tell anyone but the blogsphere about my mistakes either, and some I don’t rip back – whats a yo and a stitch out of place here and there. 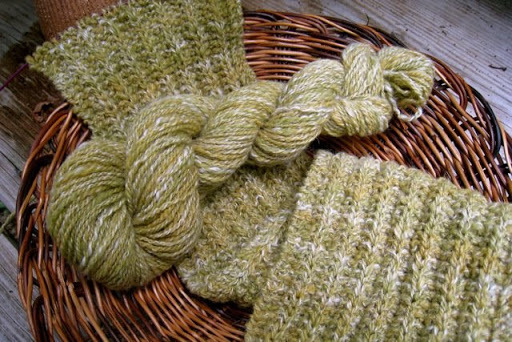 Love the pear coloured yarn – wonderful – just like winter nells pears. You must have had your body study hard to pass that test – which is fantastic news – go well, both with the knitting and the health. I’ve been thinking of you and sending you good thoughts. Keep knitting, keep reading, keep your positive attitude!